What to do when your friend fat shames and entire family. You’ve seen them, right? 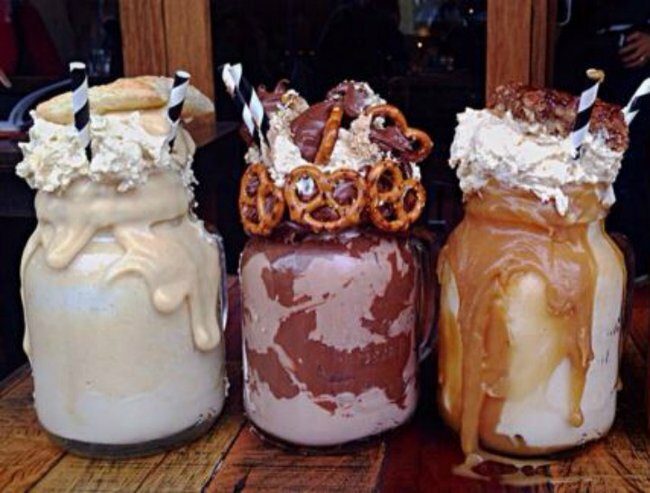 Those fancy milkshakes with donuts and lollies crammed into them? I’d never seen them in real life before until I visited a new cafe with a friend and there they were, giant chocolate milkshakes with Nutella donuts sitting on the top, the straw inserted through the donut continuing into the milkshake. I didn’t know how they were meant to be eaten, so I carefully watched a family-of-four to see how they did it. Clearly they were experts because they all did the same thing. They took a long drink of their milkshake, then carefully lifted the donuts off the straws and ate them, and then drank the rest of the shakes. They looked very pleased and satisfied afterwards. I’d shared grins with them when the milkshakes arrived at their table, saying, “They look awesome”, and I felt I had bonded with the fancy milkshake connoisseurs. My friend didn’t seem as impressed. She quickly glanced over at the table when I pointed the milkshakes out to her but returned to her salad, completely nonplussed. Just in case you share my love of donuts and Nutella and milkshakes, here is the best recipe I could find. Article continues after this video. As I re-evaluated our entire friendship, seriously considering ending it based on the fact she clearly didn’t admire fancy milkshakes as much as I did, the family finished their lunch and walked off. “We should get milkshakes next time when we come here,” I said to her. I quickly checked that the family were far enough away not to have heard her cruel words. I think they were. They didn’t turn around. “They weren’t that big and the milkshakes looked awesome,” I said. We fell silent after that. I felt quite shocked. I know we are in the midst of an obesity crisis and that there are grave concerns over children and Type 2 diabetes, however I also know that it’s not me or anyone to judge another person’s eating habits. Food is complicated. Food is emotional. They made their choices, we made ours, and that was it. I didn’t think about their weight until my friend made the comments that she did. I was too focused on the milkshakes and sharing a joke. My friend is more black and white than me. She doesn&apos;t see food as complicated, as emotional, never has. If she puts on weight, she eats less. She&apos;s never been overweight. She&apos;s one of those ones who is naturally thin. I don&apos;t think she meant to be cruel, she just doesn&apos;t delight in food as much as some of us do, and she definitely doesn&apos;t understand how complex food can be for others. "I still want to try one of those shakes next time we come here," I said. "Me too," she said, "but instead of lunch, not as well as lunch." "Okay," I agreed. Just as long as I get to try one I am happy to make whatever sacrifices are necessary. I&apos;d hate to think, though, that as I enjoyed my Nutella milksake with Nutella donut topping anyone would be looking at me with any sort of judgement, thinking that we were disgusting and feeling we should know better than to have them in the first place. Food is to be enjoyed, after all. I know one thing for sure. I&apos;d hate to live in a world where larger people felt they couldn&apos;t go out and enjoy whatever food and drinks they wanted to. Their food and drink choices are their business and nobody else&apos;s.